Hello, my name is Dan Ritchie, I'm the author of Project Dogwaffle. I am a professional animator and I use some great 3D animation programs. I also use some popular and well established image manipulation tools. However, I sometimes find limitations or difficulties when using those other paint and imaging tools. I couldn't always do the stuff I wanted the way I wanted when creating the perfect backdrops for my animations, or the steel plates for my spaceships, or the rugged dinosaur skins and other textures. I also needed foliage effects, particle systems, skies and atmospherics, light effects such as lens flares and halos and much more. And I couldn't afford to buy all these additional plugins. I thought there had to be a better way. As they say: if you want it done right, you've got to do it yourself. Is this the only program I have made? No, in fact I have been mentioned in the Lightwave 3D community for making great plugins. And some of these plugins were also merged into Dogwaffle. As you can see, this is a tool I made for myself and perhaps you too will be able to benefit from it. I sure hope so. The bare necessities of life are expensive enough these days, it shouldn't be prohibitively expensive to dabble with painting and drawing. I hope you'll be able to find some happiness in the art you make with the help of Dogwaffle. Don't be shy to share it with the rest of the Dogwaffler communities. My mission in life? I want to make movies. It is a Paint Program. Not a Photo editing program. Not an imaging tool. Not an image conversion tool. 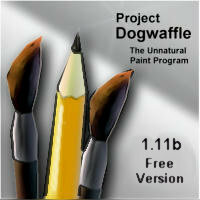 Even though it can serve many of these markets too, with various enhancement and conversion filters, special effects and color adjustments, the primary reason for Dogwaffle is for you to paint - without the mess. And no, at this time Dogwaffle does not work with popular filters from other image editing programs. Instead, we've focused on making our filters very fast and in many cases realtime. Additionally, there's an SDK so if you're a programmer and are interested in making more filters and plugins this will get you started. Much of Dogwaffle's functionality is in fact accessible through plugins. They are highly optimized for speed, and many of them operate in realtime. Some versions are free. Version 1.11b is available for free download. Version 1.15 was the first commercial release, and came out mid 2002. 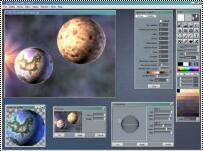 Late Fall 2002 we had v1.5, the first release with support of pressure-sensitive input from tablets. The latest is version 1.6, which came out summer 2003. It is much faster than the prior versions. If you look around for magazine cover CDs you'll occasionally find version 1.15 on a cover CD. There are also some books which carry it on the cover CD, such as Ken Brilliant's great book on "Building a Digital Human" by Charles River Media, Graphics Series. In the September 2003 issue of PC advisor and Digit magazine, version 1.15 should be on the cover CD. Dito with PC World Australia, and a German magazine (Grafik & Video / PC-go) had it in Spring / Summer 2003. So with a bit of patience you might find a more recent version such as 1.15 for free on a cover CD or in a book too. But why wait? It's cheap enough that you could own the latest download edition release within a few minutes, at least we like to think so. You bet. Version 1.15 was the first commercial release in mid 2002, and since then another release 1.5 came out late 2002. Version 1.6 was first targetted as a performance enhancement version released for sometime in Spring/Summer 2003. 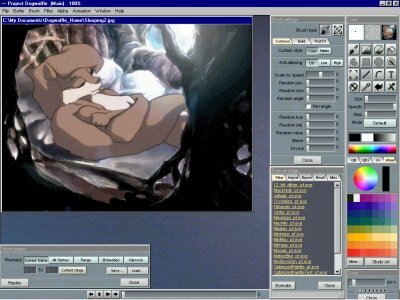 It was released early July 2003 with many new features and improvements in fact, not just performance improvements, for example Onion skins for cell animation and animated custom brushes (!). Version 1.6 costs only around $45. You can even upgrade your copy of 1.15 here with a $10 discount, i.e. for US $35, by download through the online secure webstore of DigiBuy.com. It's the fastest way to get your Dogwaffle. Where to Learn more about Project Dogwaffle? Here you can find out more about what else to do with Dogwaffle. This is my official Dogwaffle discussion forum. If I make announcements, this is where you'll find them. and a great community of dogwafflers from many continents and countries who share a common passion for the visual arts. Thank you for painting. Thank you for using Dogwaffle! In 93, I did 2 minutes of 2-D animation while concurrently working on the story. I soon went to work at a game company, Gorilla System where I first seriously started working in 3d. I still wanted to do the short, but the story was rapidly growing into a novel, and the Amiga platform that my work depended on was seeing hard times. 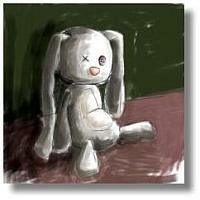 It was a fluke that I decided to write my own paint program to carry on the style of work I did. Some airbrushing code I had written on the Amiga was ported over to VB4 on the PC and with an extra weekend of work, Dogwaffle was born. It remained an "in-house" tool for some time, meaning my house.It was when I went to work at Foundation Imaging on series television that I decided that it might be better to do Silver in 3d. Unfortunately at the time, the technology was not up to the task. I spent the time learning and developing methods to do hair (the motion blur hair trick http://www.squirreldome.com/shorthair.jpg), Dynamics (Parenting goals with time offset to a skeleton -- I called it the Amazing Bunny Ear Trick), and ways to do foliage ( http://www.thebest3d.com/dogwaffle/whatsnew/1_6/optipustics/index.html ). I also had the opportunity to work on some other challenging problems. Birds can be quite an enigma. http://www.squirreldome.com/Raven05.jpg Since then I had the chance to study my own bird -- Battle Bird. I realized of coarse that I couldn't do all the work myself. I had written a proposal for a series of over 40 episodes by now. I decided it would be best to move the project along the only way I could. I decided to finish the novel, which took me several years. It is currently in progress of being published. Now, 10 years have passed and all I can say is that I think the ludicrous amount of time I've spent on this project will be worth it. Of course I still work on Dogwaffle, as it has become an invaluble tool in its own right, and I still enjoy playing in 2d as much as ever. What's not to like? Thanks for reading to the end, and now go have some fun painting - in other words, just dog it!